We imagined them bivouacking in their Uzbin camps, close to the spot where they set up the deadly ambush of French soldiers on August 18, or going for orders farther east in the caves of Kunar, sleeping on the ground itself in their chadars - the Afghan wool shawl - around their camp fires, holding close their weapons. As mountain guerillas accustomed to the elevation and the dust, a troop of warriors living on plunder from those villages where they find temporary refuge. As in the films that the Taliban's "media department" broadcasts over the Internet and distributes to all the good book shops of the region that "specialize" in jihad. Reality, as we know, often has nothing in common with war propaganda. The Taliban commanders and a good share of the men who launched the assault against the French soldiers and killed ten of them don't live in Afghanistan, but ... in Pakistan. They live in comfortable houses with their wives and children in the congested center of a big city near the capital, Islamabad, between a supermarket and the fast-food outlet of a famous American chain. That's where we found them while we were not looking for them, but tracing the trail of very personal effects that had belonged to the French soldiers and that we were offered for purchase without the least embarrassment in this region where everything is for sale. We didn't have to go far to meet them. They were right there, a few steps from our hotel, very correctly dressed in their immaculate shalwar kamiz, their beards nicely trimmed and a topi - little white skull cap - on their heads. "We were three Taliban commanders in the Uzbin attack: Mullah Zabihullah Mujahed of Saroubi, Commander Farouqi from the Laghman region and myself." Who is he? Twenty-five-year-old Omar Khattab, who looks ten years older, the Taliban commander of the Uzbin region, comfortably installed in a Saudi prince armchair decorated with whorls of gilded stucco. "The attack against the French was my eleventh operation. The time before that had been against the Italians." The young Taliban boasts of having coordinated the attack: "We had barely two hours to get our forces together! When I got the phone call that warned me about the presence of French soldiers, I immediately called the two other commanders who arrived with their men from the other side of the mountain. That allowed us to take the soldiers in a pincer movement." He also relates how, when American aerial reinforcements arrived, he held very close to the French soldiers' positions to protect himself from missiles. Omar Khattab looks women in the eyes and smiles. Very unlike the Taliban who, after their 2001 defeat, demanded that women speaking to them face the wall with their features entirely covered in a veil. He's one of the "neo-Taliban" and does not resemble his hierarchic superior Abul Pacchawar, a strict and older man seen in the films the Taliban's media department is so fond of reprimanding the new generation for. And drily asking his men to stop parading around with the French Army assault rifles - the Famas - to stop playing with laser timekeepers and fondling the insignia taken from soldiers fallen in battle. To our faces, Omar Khattab, the Taliban of the Internet era, vaunts the effectiveness of suicide operations, wi-fi, women in burqas and the role of the media. He is sorry for the destruction of the Bamiyan Buddhas, "one of the jewels of my country's archeological patrimony." He aspires to a restoration of the Islamic Republic of the Taliban, but with more openness to the outside. He would like to establish relations with the countries that have not invaded his own, but warns: "We'll fight the others to our last breath." He's a mutant product of fundamentalism and advertising. An interactive barbarian who has understood that jihad is also a propaganda war. He would so like to convince us that the Taliban are not savages, just soldiers conducting a war of national liberation! The only soldier he admits to having killed point blank while he was on the ground was, he says, about to pull the pin from a grenade. Yet it rather quickly becomes evident that his war practices are far removed from the Geneva Conventions.... "We didn't torture the French soldiers; we just finished off the wounded...."
According to Khattab, the Taliban do not conduct joint operations with Gulbuddin Hekmatyar, the Afghan politician in armed opposition to President Hamid Karzai's regime who placed himself under the command of al-Qaeda No. 2 Ayman al-Zawahiri in 2006. And yet the Islamic Party leader claimed credit for the attack against the soldiers in the Uzbin valley: "Hekmatyar did not participate in the attack against the French. He wanted to take credit for it!" Khattab hammers out, irritated by this excess of vanity on the part of his cousin in jihad. During this plunge into the Pakistani Taliban, one quickly realizes that the dissensions between different groups are significant: the only thing that unites the different Taliban commanders, the warlords and al-Qaeda members is the hatred they feel for the Americans and Westerners who occupy their country. "It's true, there are frictions between us," acknowledges Abdul Rakib Saham, a fighter from the outset for Hezb e-Islami - Hekmatyar's party - met in Peshawar where fighters and spokesmen for all the guerilla movements against NATO troops in Afghanistan co-exist. "But no more so than during the jihad against the Russians: by fighting the invaders, we forget our disputes!" Yesterday, the quarrels between groups were about the justification for decapitations. Today, they're crystallizing around the question of negotiations: "Unlike the Taliban, we're ready to meet with Karzai government representatives, on the condition that the Americans set a deadline for their withdrawal," explains Hekmatyar's man. "But between us and the Taliban, the difference is largely social: our fighters are doctors or teachers; we were always more educated than they...."
So Omar Khattab, the Uzbin Taliban commander, lives in Pakistan and fights in Afghanistan like thousands of Taliban, tens of thousands of their sympathizers, hundreds of thousands of Pashtuns and close to 3 million Afghans. And this tribal and ethnic fabric supplies an ideal rear base for the guerilla. Pakistan supplies them a refuge and an inexhaustible stock of fighters. A configuration that makes a NATO victory impossible.... Khattab crosses the border whenever he feels like it, sometimes several times a week since the trip to Saroubi only takes him three hours. One day, it's for a relative's marriage; another, for the feast of Eid, and today, for a choura, a general staff meeting. But the guerilla is also ever more active on the Pakistani side of the border. In the Peshawar region, hardly a day passes without an attack or a kidnapping - which no longer even makes the front page. In the city, fighters impose their law: the few women one still encounters in the streets wear the tchadria, the long grilled veil, the sky blue synthetic fabric of which quickly returned to being the uniform of Afghan women. There is women's coquetry in the capital of Pakistani Talibanistan: here burqas are mauve, white or chocolate. The highest officers in the hierarchy of Mullah Omar's army - or in that of other groups - possess beautiful cars and send their children to the best schools. For ever since Pakistanis chose to pay the zakat - Islamic alms - directly to so-called charitable organizations to avoid the government's corrupt channels, jihad has not lacked for money. 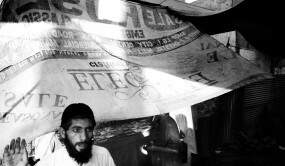 As for the foot soldiers, they squeeze into Pakistan's many Afghan refugee camps. Each camp belongs to one militant group. The Shamshatoo camp 25 kilometers southeast of Peshawar, for example, harbors close to 2,000 Afghans who live in the Hekmatyar cult. Shamshatoo, its private prisons, its spies, its schools.... Here, everything is forbidden: cigarettes, cable, music, beard trimming or wearing Western clothes. The presence of schools for girls is the only sign that it's not a Taliban camp. Some months ago, ceding to American pressure, the Pakistani authorities closed another camp, one for the militants under Abdul Rasul Sayyaf, the first to have invited Osama bin Laden to Afghanistan, the sponsor of Commandant Massoud's assassination. "The result: all who could, took refuge in center-city. The most desperate volunteered for suicide," enthusiastically explains an al-Qaeda militant. "Look around you: compared to Peshawar, Kabul is Switzerland!" But the Talibanization of one of the most worrying countries in the world - because it possesses the atomic bomb, is narrowly brushing with bankruptcy, and escapes the control of an ever-more-controversial government - does not stop at the doors of Peshawar. In Islamabad, since the attack on the Marriott Hotel, concrete partitions and barbed wire demarcating a "green zone" don't succeed in preventing attacks, even in the heart of that zone. In Karachi, we met Taliban who divide their time between their stalls and jihad. Today, according to an investigation by the Pakistani newspaper, the "Daily Times," it's the madrassas of South Punjab, on the Indian border, that supply the most candidates for suicide attacks in Afghanistan. Ever since the Americans, thrown into a panic by the extremist contagion, started to bomb Pakistan's tribal regions themselves, the majority of the Pakistani middle class and army believe that the war the Americans are conducting in the region is a war against Islam. How do the Taliban cross the border, that "Durand Line" established by the British in 1893 that is not recognized by any Pashtun? Do they use the dozens of passageways through the tribal regions that cross the 2,640 kilometers of border between Afghanistan and Pakistan? When one stations oneself at the entrance to this tribal region on the Afghan side, at Sasoobi, a strange procession offers itself up to the traveler's eyes: hundreds of entirely dismantled cars cross the rocky hills on camelback, while opium and television sets are lashed onto mules that jog along in their thousands every day along the trails crossing this tribal region over which the Islamabad government has no authority since the British Empire accorded it special status. Omar Khattab and his men, however, do not take these complicated pathways. They quietly cross the Torkham border post Joseph Kessel described. Because the border guards don't ask them for anything. No papers. No inspection. Except, when, a few days ago, one of the men who had participated in the Uzbin attack was found in possession of a camera that belonged to one of the French soldiers. The guard examined the camera, rummaged around in the dead soldier's things, then, in exchange for a bank note, allowed the man and his booty to pass. In this completely deliquescing country where everything is up for sale, the personal effects of the French soldiers pilfered during the attack could soon turn up in Kharkhano, the market held at the border of the Khyber Agency. One wanders in this bazaar of Taliban war plunder between displays of canteens, knives, American Army flak jackets on which soldiers' names still figure. On the first floor, a little more hidden, lasers and weapons. And all that with the benediction of the border guard who counsels us to leave. How did we reach this point seven years after September 11, although the United States had made Pakistan its favored ally in the war against terrorism and lavished over $10 billion of military aid on it? "It's appalling to see to what extent the Americans were fooled by Musharraf - who made them believe he could bring order to the tribal regions, while he had neither the means, nor - most especially - the will to do so," concludes the analysis of Pakistani journalist Ahmed Rachid, one of the top specialists in the Taliban. "The situation is very serious; war is spreading from Afghanistan to Pakistan and other countries will soon be affected...." confides Pakistan's Foreign Affairs Minister Shah Mehmood Qureshi to us in between two crisis meetings with President Asif Ali Zardari. He acknowledges the damage done by President Musharraf's two-faced approach to the West. While Musharraf protected the Afghan Taliban - his long-standing allies - he offered Washington a few raids and prisoners, most often right before the arrival of American visitors to Pakistan. Qureshi declares he wants to give his "Western friends" pledges of the country's new line vis-a-vis what has become "the war in Pakistan" since the attack against the Marriott Hotel. Among those pledges: the new nominations announced at the head of the Inter Services Intelligence (ISI), the dark and worrying Pakistani secret services, omnipresent on the other side of the Afghan border. But Omar Khattab, the Uzbin Taliban, and his friends are barely concerned when one mentions the Pakistani government's new determination to them. They're accustomed to these declarations never being followed by any tangible effect. They content themselves with asserting that they do not want to involve themselves in the domestic politics of the country that welcomes them and of which certain of its highest officers have encouraged them to conduct jihad against the infidels who occupy Afghanistan. As an al-Qaeda sympathizer and battle companion of the Uzbin Taliban summarizes it: "The Pakistani secret services defend their country's interest by contributing to the destruction of Afghanistan, in the name of Islam. God protect them."